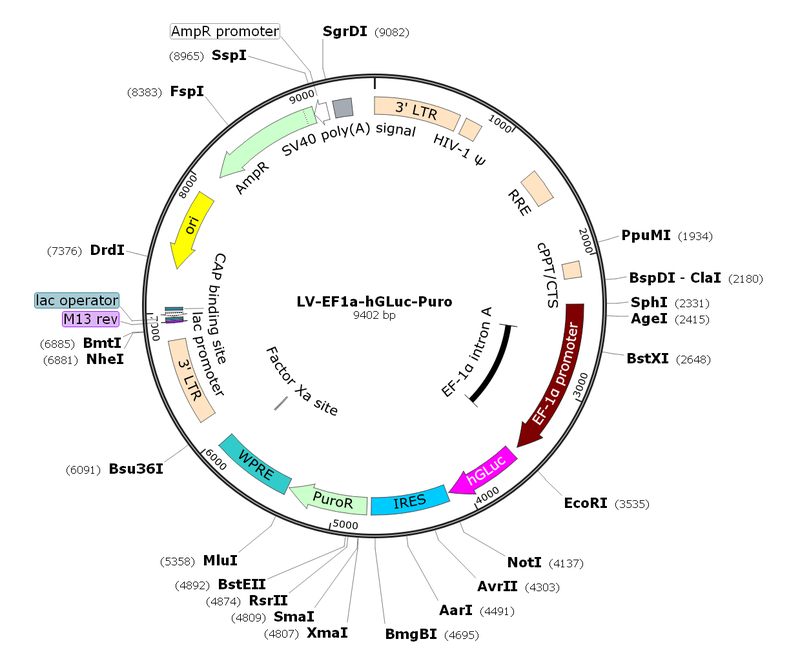 Description: LV-EF1α-hGluc-Puro is a pre-made lentivirus which over-expresses codon-optimized/humanized Gaussia luciferase (hGluc) under the EF1α promoter with co-expression of puromycin selection in a IRES cassette. The humanized form of Gaussia luciferase (hGLuc) was confirmed to be nontoxic and naturally secreted after over-expression in mammalian cells. hGLuc generated over 1000-fold higher bioluminescent signal intensity from live cell and over 100-fold higher intensity from viable cells alone (not including secreted luciferase) or cell lysates, compared to humanized forms of firefly (hFLuc) and Renilla (hRLuc) luciferases expressed under similar conditions. Furthermore, hGLuc showed 200-fold higher signal intensity than hRLuc and intensity comparable to that of hFLuc in vivo under standard imaging conditions. Gaussia luciferase provides a sensitive means of imaging gene delivery and other events in living cells in both tissue culture and in vivo, with a unique combination of features including high signal intensity, secretion, and ATP independence, thus being able to report from the cells and their environment in real time. Ready to use format.